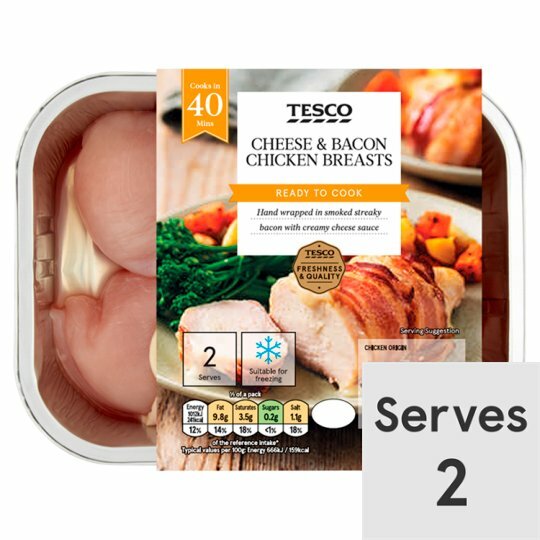 Skinless chicken breast fillets wrapped in smoked dry cure bacon with Cheddar cheese sauce. Chicken Breast Fillet (72%), Smoked Dry Cure Bacon (15%), Cheddar Cheese Sauce. Smoked Dry Cure Bacon contains: Pork Belly, Sea Salt, Sugar, Preservatives (Potassium Nitrate, Sodium Nitrite). Cheddar Cheese Sauce contains: Water, Cheddar Cheese (Milk), Whole Milk, Wheat Flour, Cornflour, Parmigiano Reggiano Medium Fat Hard Cheese (Milk), Salt, Onion Powder, Spices (contains Mustard), Potato Starch, Yeast. Instructions: 190°C /Fan 170°C/Gas 5 40 mins Place foil tray on a baking tray in the centre of a pre-heated oven for 40 minutes. Caution: The bacon in this product may cause the chicken to appear pink after cooking.This is a natural occurrence and completely harmless.Warning: Although every care has been taken to remove bones, some may remain.Caution: This product contains raw meat.Packaged in a protective atmosphere.